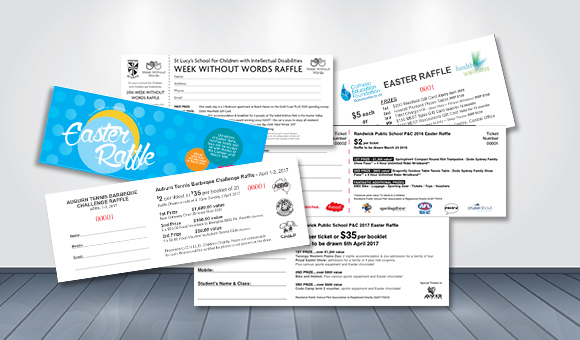 Win the world over for your charitable cause with our simple and effective Raffle Tickets. We specialise in custom designed and urgent raffle ticket printing (usually within 48hrs) for all types of businesses, institutions, clubs, schools and charities. From the humble single coloured raffle ticket you can go further and have your own specialised full colour entry / purchase tickets for concerts, venues and much more. All of our raffle tickets come sequentially numbered, collated, perfed for easy tear off and with the option for a backing cover. Custom Raffle Tickets come in batches of 500, each book of tickets contains 50 tickets. Variation of book size may change price. * Normally printed single sided, however double sided option is available. Avis printing specialises in printing raffle tickets Sydney at the best raffle ticket printing price. 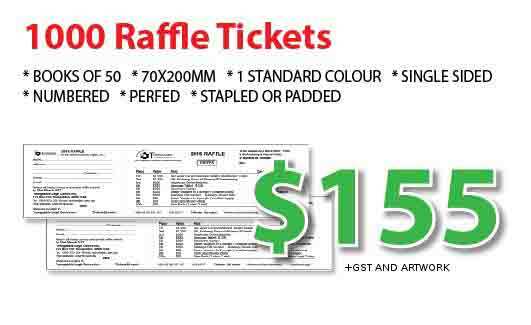 We have Sydney’s cheapest raffle tickets and the best quality raffle tickets available. We produce black and white raffle tickets, 2 colour raffle tickets, full colour raffle tickets, double sided raffle tickets and offer raffle ticket printing specials every day. 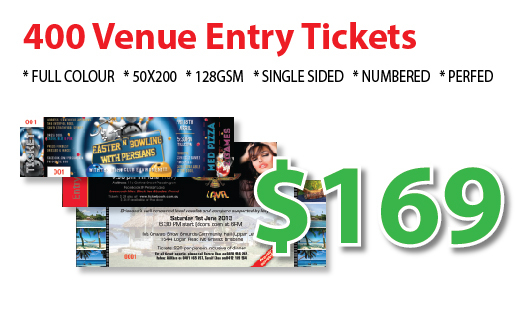 In fact we offer the cheapest 100,000 raffle tickets printing in Australia, backed up by our lowest price guarantee to give you the best price for raffle tickets. We also design custom raffle tickets.